One of my favorites from home. Leave the head on and use a paring knife. Cut the top of the shell on the tail from front to back, only going thru ½ of the tail meat. Carefully wash the trail out of the tail with running water in the sink. In a food processor puree the onion and garlic until fine. Add all of the first nine ingredients and process until all is blended. Melt compound butter on medium heat and add shrimp. Lining shrimp up all facing the same direction will make them easier to flip. 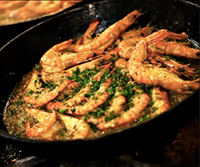 Cook shrimp in compound butter for four minutes on each side and remove from pan. Line shrimp on a serving platter. Add Landshark Lager to butter mixture and flame. Once reduced (about 3 minutes), pour mixture over shrimp and garnish with chopped parsley. Serve with French bread for dipping.